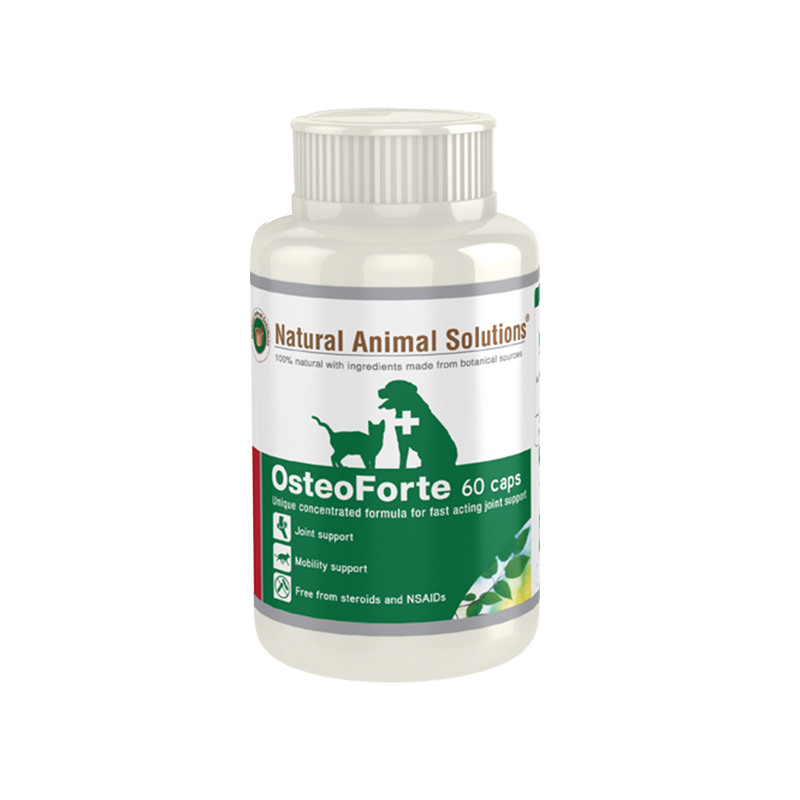 Natural Animal Solutions OsteoForte 60 Caps is an ideal formula for your pet’s joint health. The naturally developed joint supplement is an internationally patented herbal formula based upon proven Ayurvedic herbs and medicine. This fast acting joint care is specially formulated for advanced cases. It helps keep your pet’s joints strong and healthy. The oral caps assist in preventing mobility problems due to age and help your pets lead active and healthy life. Natural Animal Solutions OsteoForte caps contain key ingredients obtained from natural source. These active ingredients promote cartilage and joint health. Free from steroids and NSAID’s, the OsteoForte is safe for your pets and easy to administer. Administer orally into mouth or mix it with food. Small dogs and cats: ¼ capsule twice a day. 10-15 kg dog: 1 capsule a day. 30 kg dog: 1 capsule twice a day. 60 kg dog: 2 capsules twice a day. Offers high level mobility support. Satisfied with the results because it has effectively helped in improving the joint health of my senior pooch,Jacky. Grateful. I am now using it as daily supplements for dog and it is been very helpful. I have set it into auto order today. After learning about the benefits of this product with no side effects due to its natural contents, I am now buying this product for my dogs. Moreover, I buy all my supplements here since they are always in stock, the best prices and have free shipping. Using this product on and off around the year. Can find significant change in the movement of my dog. I tried many supplements but this seems to work on my dog.